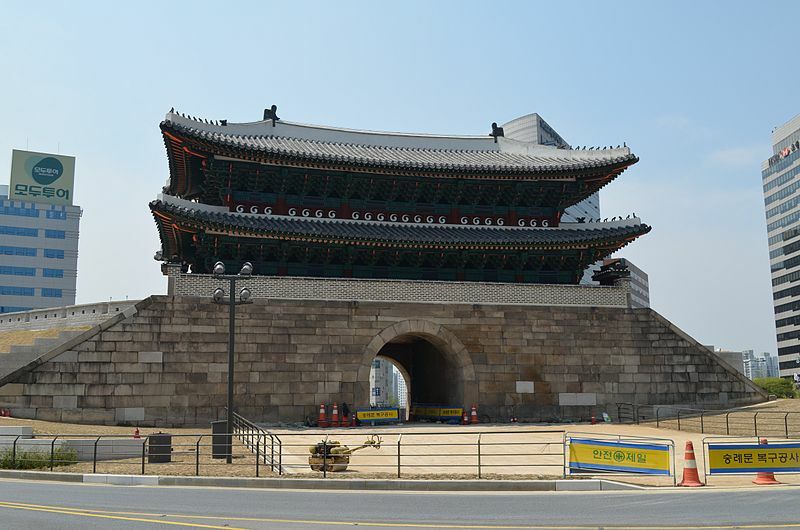 Namdaemun, officially known as the Sungnyemun (literally Gate of Exalted Ceremonies), is one of the Eight Gates in theFortress Wall of Seoul, South Korea, which surrounded the city in the Joseon Dynasty. The gate is located in Jung-gu between Seoul Station and Seoul City Plaza, with the historic 24-hour Namdaemun market is next to the gate. The gate, dating back to the 14th century, is a historic pagoda-style gateway, and is designated as the first National Treasure of South Korea. It was once one of the three major gateways through Seoul’s city walls which had a stone circuit of 18.2 kilometres (11.3 mi) and stood up to 6.1 metres (20 ft) high. It was first built in the last year of King Taejo of Joseon’s reign in 1398, and rebuilt in 1447, during the 29th year of King Sejong the Great of Joseon’s reign. In 2008, the wooden pagoda atop the gate was severely damaged by arson. Restoration work on the gateway started in February 2010 and was completed in 29 April 2013. It was officially reopened on 5 May 2013. This entry was posted in Korean History, Tourism and sights by admin. Bookmark the permalink.